Plastic pollution is a disaster as it is—and a catastrophe in the making. In just one year, as much as 300 million tons of plastic is produced. Over 12 million tons of plastic waste ends up in the ocean each year. In many parts of the world, plastic pollution has caused significant damaging effects to the people, and the environment. It’s time to stand up, and help put a stop to this. Plastic use has become a hit. As a result, plastic pollution is an epidemic. About 10 percent of our plastic find its way to the ocean where it threatens the life in, and the eco system of, the ocean. Animals think the trash is food and ingest it. Plastic blocks sunlight from reaching plankton and algae, which put strain on the ocean’s eco system. But how do all the plastic even get there? At times people throw plastic in the garbage or trash instead of recycling it. This plastic is luckily in a trash bin, but it will never reach a recycling center. Instead it will travel to the landfill where it will sit for eternity one would think. However, during the trip to the landfill some of the plastic will fall out and at the landfill, the wind will most likely pick some of it up and blow it away. The plastic trash will then sit somewhere in our environment. Some will find its place straight to water, others will clutter around drains, while other pieces will sit in the sun and get broken down into small pieces of plastic that at some point will find their way to a water source. Other times people litter. The trash we see next to our roads does not just sit there until picked up. The wind and rainwater will carry the waste into streams and rivers and through drains right out to the ocean. Plastic finds it way to water through our storm drains, but it also finds it way to the ocean through our drains in the house. At times, we actually flush plastic right down our drains and into the world. Maybe without even knowing about it. You know those flushable wet wipes? Many are made with plastic fibers and we flush them straight into our water source. Even clothes have pieces of microplastic in them that gets flushed out with the laundry water. The wind help the plastic reach our ocean. There are actual garbage patches floating on the ocean surfaces. They are all made of plastic. 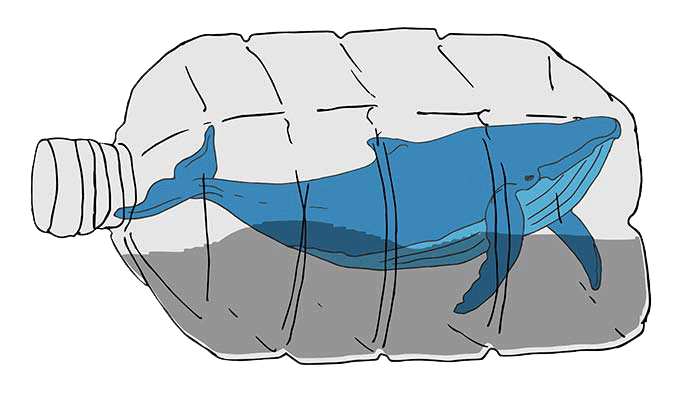 Marine life are literally filled with plastic. All because most people don’t have enough knowledge, or care, to actually recycle and reduce their use of plastic.